2 When and How Does it Occur? Gluconeogenesis quite literally translates as ‘the production of new glucose’. It is a metabolic pathway that results in the generation of glucose from non-carbohydrate carbon substrates such as lactate, glycerol, and glucogenic amino acids. This article shall consider the process of gluconeogenesis as well as relevant clinical conditions that may occur when something goes wrong. When and How Does it Occur? Gluconeogenesis occurs beyond around 8 hours of fasting when liver glycogen stores start to deplete and an alternative source of glucose is required. It occurs mainly in the liver and the kidney (to a lesser extent in the cortex). There are three main precursors: Lactate from anaerobic glycolysis in exercising muscle and red blood cells via the Cori Cycle; Glycerol which is released from adipose tissue breakdown of triglycerides and amino acids (mainly alanine). Fig 2 – The Cori cyle showing how lactate is generated by muscles and then used by gluconeogenesis. Gluconeogenesis has a close relationship to glycolysis. Whilst glycolysis is the breaking of glucose, gluconeogensis is the creation of glucose. However, gluconeogenesis is not as simple as reversing glyolysis, as there are irreversible steps in glycolysis. Therefore, to circumvent this, some more enzymes are important in gluconeogensis, such as Phosphoenolpyruvate carboxykinase (PEPCK) which converts oxaloacetate to phosphoenolpyruvate. Fructose 1,6-bisphosphatase is also important, converting fructose 1,6-bisphosphatase to fructose fructose 6-phosphate. 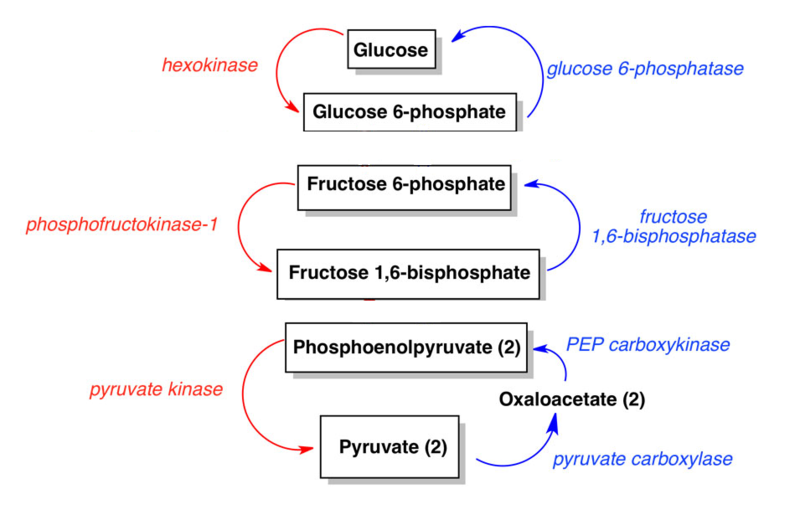 Finally, glucose-6-phosphatase turns glucose 6-phosphate to glucose. 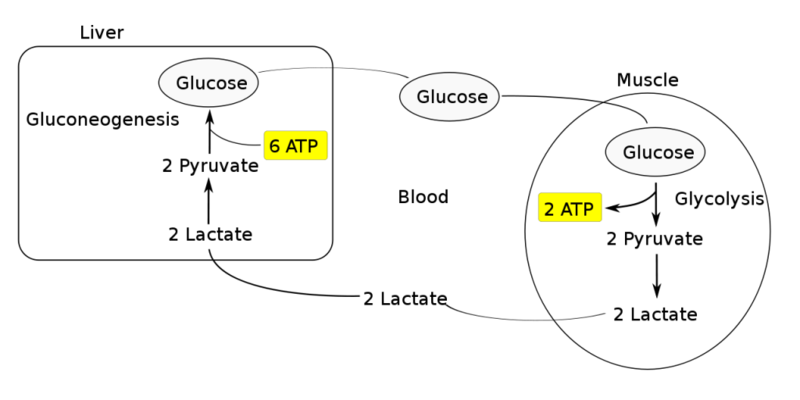 Fig 3 – The 3 steps that are different in gluconeogensis and glycolysis. Gluconeogenesis, like glycolysis, is under tight control of hormones to regulate blood glucose. Stress hormones such as glucagon or cortisol upregulate PEPCK and fructose 1,6-bisphosphatase to stimulate gluconeogenesis. However, when there is a fed, high energy state gluconeogenesis decreases by inhibiting PEPCK and fructose 1,6-bisphosphatase. Gluconeogenesis is one the major contributors to the hyperglycaemia that is seen in diabetic patients as cells ‘feel’ starved of nutrients and so send out hormonal signals to increase glucose levels in the blood via gluconeogenesis. Alcohol abuse alters the NAD+/NADH ratio leading to excess NADH. This inhibits fatty acid oxidation that provides ATP and favours the pyruvate to lactate reaction, thus depleting the supply of pyruvate for gluconeogenesis and causing hypoglycaemia. This leads to hepatic glycogen depletion combined with alcohol-mediated inhibition of gluconeogenesis and is common in malnourished alcohol abusers. Where does the lactate production of the Cori cycle take place? Which of these is a substrate for gluconeogenesis?